Spring is a time when our thoughts turn to lighter, healthier meals made with seasonal ingredients. 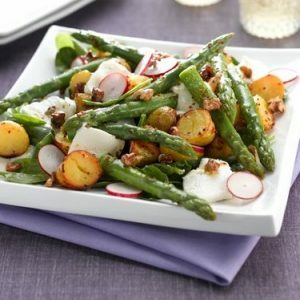 New potatoes and asparagus are at the peak of their season now and they blend beautifully with goat’s cheese and a tangy mustard dressing to make a nourishing and satisfying light meal. Be sure not to overcook the asparagus in order to retain its high levels of vitamin K, folate, selenium, copper and vitamins B1 and B2. This recipe serves 4. 1 Pre-heat oven to Gas 6/200F/400F. Parboil the potatoes for 15 minutes until slightly tender. Drain and cool for 5 minutes before placing in a roasting pan. 2 Mix the dressing ingredients, seasoning with salt and pepper if desired, and pour half over the potatoes, mixing well. Roast for approx 25 minutes until soft on the inside and crisp on the outside. Sprinkle the walnuts on a separate baking tray and dry roast for 3 – 4 minutes to intensify their flavour. Do not let them burn! 3 Trim the woody ends off the asparagus spears and discard. Steam the asparagus for 5 to 7 minutes (depending on size) until tender. Place in a dish and pour over the remaining dressing. 4 To assemble the salad: cover the base of a large, wide salad bowl with spinach leaves; place the potatoes on top followed by the sliced goat’s cheese (which will melt slightly), and then by the asparagus. Finally sprinkle with the roasted walnuts and garnish with the radish slices. Recipe copyright © The Vegetarian Society 2007.